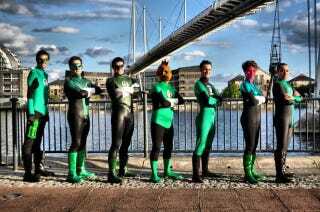 There were many things wrong with Green Lantern besides the CG "streaky bacon" outfit that Hal Jordan and his fellow Corps members sported. But the choice to give Hal a CG outfit against a CG background certainly did the movie no favors. And the sad thing is, the Green Lantern uniform is a classic. It's skintight and spiffy, with nice clean lines. Cosplayers routinely put together Green Lantern outfits that beat Ryan Reynolds' mocap disaster, and here are some of our favorites. Note: We are not saying these are necessarily movie-quality costumes, or that Warner Bros. should have torn these outfits right off these cosplayers and stuck them on some actors. But these costumes have something that Hal's movie duds simply didn't: they look cool. Kyle Rayner's costume, as designed by Ivan Reis — worn by Cloudwarrior, via Cosplay.com. Don Robert as Green Lantern Hal Jordan at the 10th Philippine Toycon at the SM Megamall, photo by Isabel Cortez on Deviant Art. From SDCC 2009 — I just like how shiny it is. Photo by John Chennavasin on Flickr. A nice-looking John Stewart from Wizard World Anaheim 2011, photo by PopCultureGeek.com on Flickr. A pretty great Kyle Rayner at Dragon*Con 2008. Photo by Cryptonaut on Flickr.